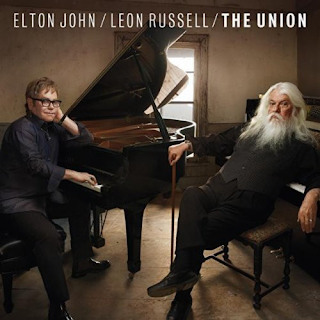 Elton John finally got to record with his long-time hero Leon Russell, the man who influenced his sound more than anybody, on this appealing album. The opener, "If It Wasn't For Bad" introduces us to Russell's slightly hangdog, world-weary voice. The song has a great hook, I find it reminiscent of an old Style Council track for some reason. Elton's "Eight Hundred Dollar Shoes" is a melodic piano-driven ballad with hints of Elton's early albums. "Hey Ahab" is a big, rousing blues number that Elton performed impressively in concert for a few years after the release of this. His voice sounds great on this and the song is driven by its strong backing vocals too. "Gone To Shiloh" is an evocative Bernie Taupin song about the US Civil War, the sort of song he has specialised in over the years. Neil Young contributes vocals to the song, effectively. The country-ish but bluesy "Jimmie Rodgers' Dream" is another instantly catchy one. "There's No Tomorrow" is a New Orleans gospel-flavoured mournful, with some killer guitar in the middle, while "Monkey Suit" is another pounding rollicking number that Elton did so well in concert. Classic, upbeat Elton blues. The album is actually fourteen songs in length, so it lasts a fair old time. I could go on about each individual track but it is probably not necessary, they do not change much in style. Basically, if you like early Elton John, piano-led bluesy rock with airs of country, and lyrics of the Old West, Taupin-style then this is for you. Russell's style, delivery, piano playing and indeed songs are very much in the fashion of John/Taupin's - so they both feed successfully off each other. The piano on the lively "A Dream Come True" is superb. A breath of fresh air pervades all around this album. It is enjoyable from beginning to end. Just check out the lovely "The Best Part Of The Day", Elton at his absolute best, with Russell's touching help. Just beautiful.